Welcome to Art by Diesel, where I offer my unique selections of handmade collectible items. 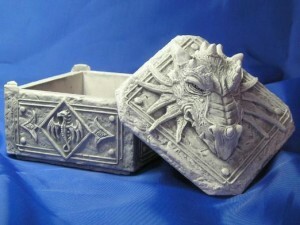 Here you will find many interesting items at very affordable prices, many with a fantasy or gothic theme. Every stage of the production is carried out by me. I produce every mold from my original sculptures. From these, resin or hydrostone (a porcelain like gypsum cement) castings are made. The final piece is hand finished with colored washes to bring out all the fabulous detail and give depth and definition to my three dimensional art. The final touch is to have each piece receive my signature. The result is a collection of unique and affordable pieces of handmade decorative art. Whether you need a unique gift for a special occasion or just want to treat yourself to a dazzling handmade treasure, Art by Diesel is where you will find it! Oh yes… and there are art prints available too!